The word 'ungulate' comes from the Latin 'ungula', meaning hoof. It has long been used as a term to describe any hooved herbivorous mammal, but the ungulates have not been thought to constitute a single group of closely related animals until recently. The 'ungulates' were considered to comprise the Artiodactyla (even-toed ungulates like pigs or cattle), the Perissodactyla (odd-toed ungulates like horses or tapirs) and various fossil groups of primitive ungulates. The aardvark, elephants and hyraxes were referred to as 'subungulates'. The Order ARTIODACTYLA (even-toed ungulates eg. pigs, camels, deer and cattle). The Order PERISSODACTYLA (odd-toed ungulates eg. horses, tapirs and rhinoceroses). The Order TUBULIDENTATA (the aardvark). The Order CETACEA (whales and dolphins). 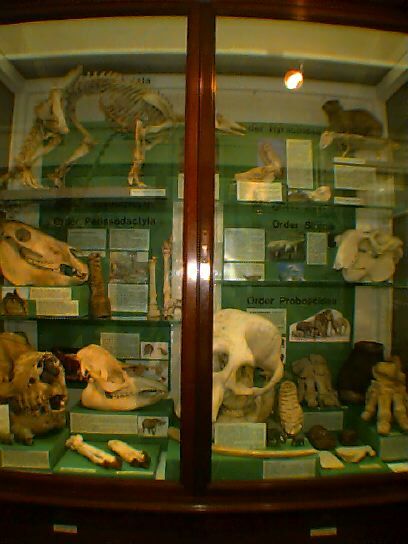 There are also several orders of EXTINCT UNGULATES. 'Ungulate' is a much abused term. The zoologist Alfred Sherwood Romer noted that "almost all the larger herbivorous members of the class [Mammalia]" may be ranged under the term, but he acknowledged that this may include several independently evolving lineages. 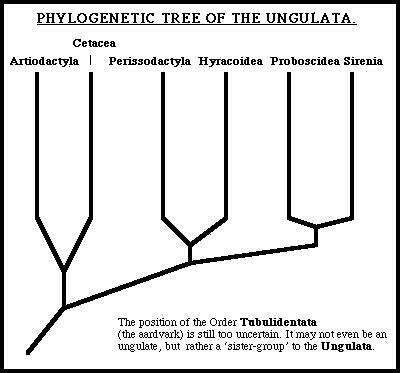 This rather broad definition of ungulate contrasts with the traditionally narrow definition of 'Ungulata', which included only the Artiodactyla and the Perissodactyla. All the orders listed above have recently been shown to have all come from a common ancestor, separate from other mammal groups. 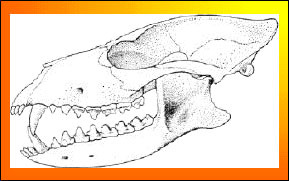 The earliest ungulate known is Protungulatum, from the Late cretaceous of North America. It was a small, insectivore-like animal with teeth slightly adapted for grinding.